Using Portrait Mode on your digital camera can often help you separate your subject from a busy or distracting background. This mode is based on the premise that using a limited depth of field emphasizes the subject, making it stand out sharply against a softer background. In portrait mode, your camera will use a larger aperture and a faster shutter speed. You can see below how less depth of field helps make a subject more prominent by blurring out distracting background detail. Begin with your camera in the auto mode and position your subject in front of a busy background. 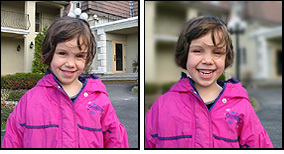 Compose your picture as a head and shoulders portrait but include some of the background in the picture. Take the first shot and check it. Your subject should be sharp, and the background will probably be sharp too. Next re-set your camera to the portrait mode and take the same picture. Your subject should be sharp in both pictures. But in the second shot the background should not be as sharp, making it less distracting. Because depth of field is affected by distance as well as f-stop, be sure to position the subject away from the background as much as possible so you can more easily see the effects of the portrait mode. Focal length can also affect DOF, and digital cameras have much shorter focal lengths than traditional 35mm lenses. For this reason, even portrait mode may not effectively blur the background enough to be noticeable. There are several ways to control depth of field when shooting portraits and they will be covered more thoroughly as we progress. But for now, using portrait mode will give you one more option when using your camera’s automatic features.